Enable rapid follow-up imaging or archival analysis of the putative astrophysical sources. AMON participants can be characterized as “triggering,” “follow-up,” or both. Triggering participants are generally observatories that monitor a large portion of the sky and feed a stream of sub-threshold events into the AMON system. 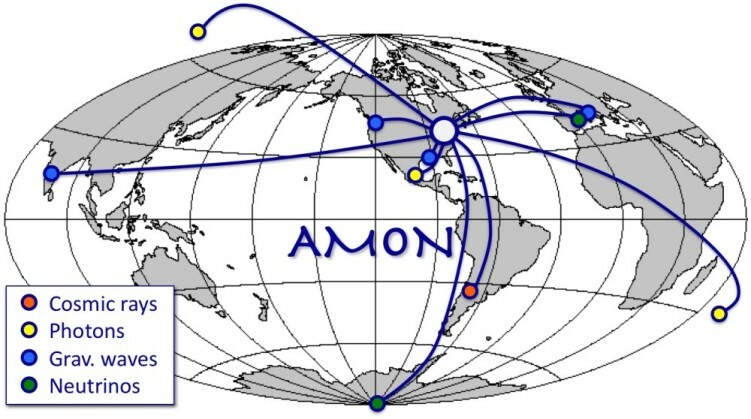 These events are processed to search for temporal and spatial correlations, leading to secondary “AMON alerts.” Follow-up participants generally search for electromagnetic counterparts to the AMON alerts with high-throughput, narrower field-of-view telescopes. Follow the AMON blog for the latest about AMON status and the ongoing projects.